Terrence J.L. Reeves is a member of Pepper Hamilton’s leading Emerging Growth and Venture Capital groups. 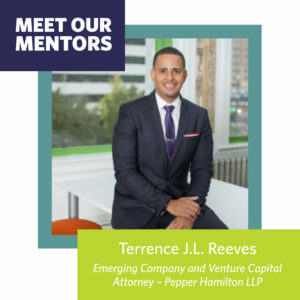 Terrence works with emerging companies in mobility, security, consumer products and digital health in CA, FL, IL, MD, MI, NY, PA, TX and Washington D.C.
Terrence currently serves on the Board of Directors for the Michigan Strategic Fund and IrishAngels, and on the Advisory Board for the Zell Lurie Commercialization Fund. He also co-founded Run This Town, a Detroit-based and award-winning community fitness organization, to combat obesity and promote healthy living in Detroit, Kalamazoo, Chicago, and Ann Arbor. Seed investing, angel investing, partnerships, venture capital, growth capital, governance, and mergers and acquisitions. I am excited about the opportunity Endeavor Detroit gives mentors to serve entrepreneurs throughout Michigan. A critical component of my career – as a lawyer, entrepreneur, investor, and public servant – has been mentorship. My mentors have each freely shared their time and expertise to empower me to make better, more informed decisions. Endeavor Detroit provides a similar platform for me to do the same for our entrepreneurs. My greatest challenge in business was adapting my leadership style to a pre-funding startup. Entrepreneurship is stressful; bootstrapping even more so. That said, I was ill-prepared to lead members of my team who were navigating the challenge of delivering a solution to the market while simultaneously facing down unpaid bills and eviction notices. I have since re-worked my leadership approach to incorporate motivational tactics devoid of monetary rewards. Creating opportunities for small wins and then celebrating those wins are vital. But I also set more realistic milestones and fight back the desire to win the first to market race to ensure the team has the energy, tools and motivation to complete the marathon. My experience as a co-founder also taught me a great deal about me and how important it is to discuss (and potentially, test) working styles before onboarding team members to set the groundwork for company culture and expectations. After running into some challenges after closing our seed round for Networkingout, we successfully returned the invested capital back to our angel investors. Having a deep conviction to solve the problem that the company aims to solve. I changed my last name in 2014 from Thompson to Reeves to carry on my family name at my grandmother’s request.